Help keep others safe and make sure their home is winter ready! 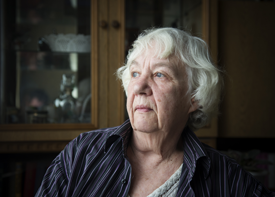 Cold weather can be a worry for older people. Help your elderly relatives, friends and neighbours to stay safe and warm this winter by taking a look at our top tips. And during a cold weather check and make sure they are okay. The Safe and Well Visit is a totally free service offered by Oxfordshire County Council Fire and Rescue Service. We visit people in their home to see we can do to make them safer. During the visit we also have a chat with them on how they may be able to improve their health and wellbeing, along with fitting free smoke alarms and offering advice on how to make their home safer. Older people are no more likely to have a fire than anyone else they are however more likely to become a victim of a fire if one occurs. Install smoke alarms for them on every floor of the home and make sure they are tested regularly. Make sure they have an escape route and keep it clear. Make sure all plug sockets are not overloaded. If they smoke, make sure they use an ash tray. Make sure the filter in the tumble dryer is cleaned regularly. Ensure that portable heaters are kept away from curtains and furniture and are not use to dry clothes. Make sure that electrical items are still safe to use by checking the Electrical Safety First website. Make sure that the chimney is swept regularly. Install a carbon monoxide alarm in each room that has a gas appliance and test it regularly. Ensure that all candles are secured in a holder. If they use an electric blanket check it regularly and make sure it is safe to use. If water pipes freeze they can burst. Make sure you all know where the main stopcock is and check that it's easy to turn so you can turn off. Make sure they are claiming all the financial support you can to help with heating bills. Encourage them to dress in plenty of layers and make sure they have warm shoes or boots with non-slip soles. If the power goes off, or there’s a problem with the water supply then utility companies have a priority service for vulnerable people to ensure that supplies for those residents are dealt with first. Many people don’t like to ask for help, however if the water or electricity fails then it can be distressing, especially in the winter, and potentially dangerous if someone uses equipment such as a dialysis machine or ventilator. The elderly, disabled, or anyone who uses specialist medical equipment, could benefit from joining water and electricity priority care registers. Call the free number 105 to check what’s happening. Call Thames Water on 0800 980 8800 to find out what's happening. If they live alone it’s important that contact and medical details are easy to find in the event of an emergency. To help out our Emergency Planning Team are giving away a free green bottle for people to store important information, such as personal details, emergency contact details, doctors details, medications and allergies. If the emergency services are called they will look for the green cross symbol on the back of the front door and will then know to look in the fridge for the information in the green bottle. The Live Well Oxfordshire! website tells you about a range of support services across Oxfordshire for adults (18+), families and carers. It has information to help you to find your own way to meet any needs for support and care and for you, or a loved one, to lead the lives that you want. Visit the Age UK website for great tips and advice.